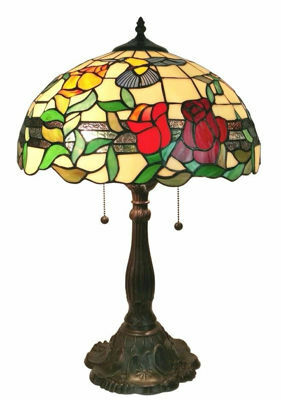 Add warmth to your home decor with this unique Tiffany-style table lamp. Spirited hummingbirds flitter in this beautiful garden scene on this multi-colored table lamp. This colorful lamp is sure to brighten any room. The classic Tiffany style has an air of sophistication and class, while the scene depicted adds a dash of whimsy. Because the product is handmade, slight variations in color, size and design make each piece unique. This lamp is handcrafted using the same techniques that were developed by Louis Comfort Tiffany in the early 1900s.